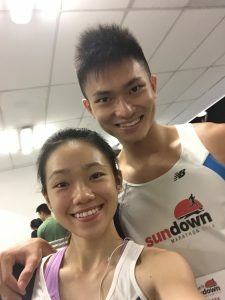 Race Review: OSIM Sundown Marathon 2016 [Half Marathon] (By RunYourPace) | JustRunLah! The Sundown Marathon is Singapore’s first night race. With its humble beginnings back in 2008, starting with only 6000 participants, it has since become the largest night marathon in Asia today with a figure of over 25,000 participants this year. Sundown Marathon has firmly established itself as one of the highlights of the Singapore running calendar. The Sundown Marathon is definitely not for the faint-hearted, as participants are faced with the additional challenge of running through the wee hours, with categories such as the full marathon flagging off past midnight. Kelsey and I are usually really early sleepers, and we often feel sleepy even when it’s just 10pm… so we have absolutely no idea why we signed up for this event haha. We knew that it was going to be a torture to stay awake and run and yet we still decided to sign up for it. The idea of being part of this grand event probably just robbed us into signing up for the half marathon category. The race pack collection was held over a span of three days on the weekend before the actual event at the Suntec Expo. Besides Standard Chartered Marathon Singapore, Sundown Marathon is probably the only other running event that has a large scale race expo in Singapore. You can find booths from most of the well-known sports outlets, including Key Power Sports, Runninglab etc. We collected our race packs in the afternoon on the second day of collection and it was a smooth process. There were no queues at that timing and we simply walk straight through the counters. Next up, it’s shopping time! There were some really good deals going on and our advice to runners, stock up your gears only during the expo. You really do save quite a fair bit. We stocked up on our GU energy chews because it was going at only $2.50 per packet, which is a decent discount from the U.P of $3.50 or so. We also got ourselves 3 pairs of Injinji socks at a deal of 3 for $39, which again is a great discount from the U.P of $19.90 each pair. Injinji is one of our favourite brands for socks because the individual slots for each toe really help to prevent blisters for long distance running. It really works! So check it out if you are having issues with blisters. I do remember that the socks were going at an even crazier deal of 3 for $30 during the 2015 expo, but I guess its inflation at work. There were also freebies going around during the expo too. 42race was giving out free bandanas with just a simple email subscription to their website and Gymboxx was giving out vouchers with free 1-day gym pass. Overall, it was an eventful expo and while many runners may find that the expos are pretty much similar every year, we still get really excited to browse through the booths. We made our way to the race site via the MRT and alighting at promenade station, which was just a short walk away. Interestingly, when we reach the race site, the first thing we saw was this huge cage where teams are pitting against each other in a game of dodgeball. Apparently, this was part of the new initiative known as the Sundown sports zone, to spice up the atmosphere in the race village. It is a competition where teams sign up and compete for the top prizes. Interesting concept, but we are a little skeptical if that was what runners really want. After all, there wasn’t much crowd of runners attracted to it. The sports zone was located far away from the main race village so it felt more like a segregated event. We thought it would probably be a better idea to let the runners be the participants of this sports zone for free as a post race fringe event. Since we had some time to spare before our category flag off, we decided to walk around the race village. Soh Rui Yong, one of Singapore’s top marathoner, was the ambassador for this year’s event and his face was spam all over the race village. A huge pity that he wasn’t present at the event though! Otherwise, poor Kelsey wouldn’t have to take a photo with just the poster. There were many booths selling food for the hungry runners as their post race meals and boy were we so tempted to get some of it even before we ran. There were lots of varieties, ranging from Japanese food such as rice ball and udon, to western cuisines such as wraps. We held ourselves back and promised to come back to the booths as a post-race reward! After a tour of the race village, we went ahead to deposit our bags at the baggage deposit located just beneath the F1 pit building. The efficiency of the bag deposit was pretty impressive, considering that there were some runners collecting while others depositing their bags at the same time. 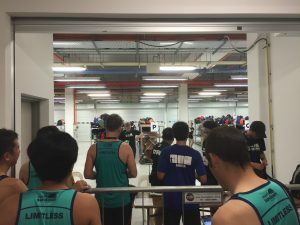 This is the first race we have seen, that is held at the F1 pit building, which utilises the building for baggage deposit rather than the usual makeshift tentages. Thumbs up for that! Lastly, it was time for our pre-race ritual – Visiting the portaloos. (because we love to poop. just kidding) Another great experience with the portaloos as it was well spread out around different areas of the race sites. There were 3 sections of loos with about 20 loos in each section – An abundance of loos. So far so good, all was well, until the moment when the starting pen was opened to runners. Unsuspicious of anything, we went ahead to what seemed like an opening to the starting pen where a large crowd of runners was funneling through a small entry. As we moved further in, we were alarmed to see that there were barricades all around us to prevent us from moving further ahead to the starting line which was around 200m in front! Across where we were standing, we could see another group of people streaming into the 200m of empty area that separated us from the starting line. It turns out that there was more than one starting pen and we had unknowingly entered the one catered for runners running above 3hours! So basically, we were stuck together with this whole group at back of the starting line probably fated to be in the last wave (faints), as people on the other side of the barricade continued to stream in to fill up the space at the front… There were alot of people in this group obviously upset with this situation. All of us had came early to the starting pen but we were now stuck at the back! There was a lack of information being passed down to the participants regarding this and how on earth were the organisers supposed to know who are the 3hours and above runners with no indication on our bibs?!? Many runners were angry at the security, but of course, we do understand that they were just carrying out the instructions given by the organisers. Some runners attempted to climb over the barricades and many were warned and scolded by the security. Things got really out of hand when one frustrated participant just slam open the barricade and charged out the front of the starting pen. The opening between the barricades allowed many others to follow suit and we were lucky to sneak out of it too 😬 . But you could tell that the security was so pissed off and he was barging through to fix the barricade as to prevent any more participants from slipping out. It was quite a chaotic scene to be honest. I really do hope that the organizers can take such issues seriously in the future and if starting pens separated by timings were to be implemented, information has to be well disseminated to the participants way beforehand. Anyway, we were lucky to get to the nearer starting pen eventually and we set off in wave 2. We would probably have been in wave 1000 if we were still stuck behind the barricades. As usual, I accompanied Kelsey throughout the half marathon running at her pace. The Sundown crowd was really huge in numbers and there was little space to run in the first km. There were even short moments initially where everyone had to stop because the crowd was simply too large for the narrow routes. The crowd eventually spread out as we meet with a steep long upslope up a bridge soon after the first km. We turned into East Coast Park (ECP) after 3.5km on the bridge and began another 3.5km stretch along ECP before U-turning out. It was a cooling stretch and the portion of ECP in the route was just about right (not as long as the FM where they spent almost 20km inside ECP). I enjoyed this stretch because it was just a straightforward flat path. However, we did encounter some issues with other participants here. There were some who just recklessly stop in front of us, and I had to brake awkwardly in order not to knock into them. It got a little frustrating because it was so dangerous for everyone! Soon, we got out of ECP and reached Gardens by the Bay where the real problem struck us. Around 16km, Kelsey suffered really badly from the lack of long distance training which was accompanied by the sleepy bug. She began feeling nauseous and couldn’t carry on running no matter how hard she tried. It was really disappointing for us because we were only a short 5km away from the finishing point and she had a good chance to better all her HM timings previously. She decided ultimately that it was too uncomfortable to carry on running so she slowed to a stop. We walked on for the next 2km, but things didn’t seem to get better for her. Just as she was about to begin running again, comes the marina barrage slope. It wasn’t a good idea to run up the slope in her conditions, especially with some 2km left to the finishing point, so we cleared marina barrage by walking. Following which, she gathered whatever energy she had left and ran as much as possible, with some walking in between. Finally, her dreadful night came to an end when we crossed the finishing line in a timing of 2hrs 45minutes. It was quite a surprise because we thought that it was definitely going to take more than 3 hours with all the walking. Nevertheless, she pushed on as best as she could and I’m proud of her. Kelsey was still feeling all unwell and nauseous after the HM and we had to cut short our night at the race site so that she could get home to rest. Oh well, despite all the delicious looking food at the booths, we didn’t get any of it. That’s it! Our Sundown Marathon 2016 came to an end. It was a mixed experience for us in terms of the race organisation, with some really good set up at the race village, to the huge deal breaker at the starting pen. I would also love to see more focus and investments into runners’ benefits and experience rather than churning out more unnecessary stuffs. The race pack is getting barer every year while the fees had continued to stay high. Overall, it was still a good event but there is definitely room for improvements.